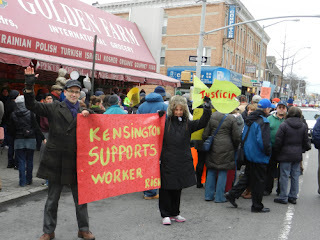 The Golden Farm workers have stayed strong throughout their fight, week after week, and they couldn’t have kept it up without you-the community-supporting them along the way. As we approach the first round of negotiations between the workers (represented by RWDSU/UFCW Local 338) and the owner Sonny Kim with his lawyer in the final days of November, the workers have asked the community to show our strength on the busiest shopping day of the year. WASHINGTON - In the aftermath of a surprisingly lopsided victory for President Barack Obama’s Democratic Party and for progressive causes more broadly, one of the key discussions taking place here is over the suddenly increased prospects for comprehensive immigration reform, long an issue so divisive that few politicians have been willing to tackle it. WASHINGTON — Fresh off an election in which Hispanic voters largely sided with Democrats, Speaker John A. Boehner said Thursday that he was “confident” Congress and the White House could come up with a comprehensive immigration solution. MAKE THE CALL, SIGN THE PETITION TO SUPPORT SERGIO - It's a matter of life or death! This week, there were some great victories for workers, immigrants, the LGBT community, and more BUT the work for us and for the people we fight for continues. One of our leaders of the Dignity at Darden campaign in Los Angeles has been in an ICE detention facility since May of this year. Sergio is a ROC-LA member, a gay man living with AIDS, who was recently diagnosed with cancer. Doctors found a tumor in his head - but Sergio is not getting the medical treatment he needs. Sergio was told he needs chemotherapy as soon as possible but he is not getting the treatment he needs in detention. His health is deteriorating rapidly, and without the proper treatment Sergio could die soon. Santa Ana City Jail has a record of abuses of gay and transgender detainees, delays in medical care, and reports of mistreatment. Sergio needs to be released immediately! Please take a minute to sign the petition, share it with others, and make a call to ICE! Sample Script: “Hi, I am calling to urge ICE to release Sergio Vazquez Gutierrez (A# 200-243-222) from the Santa Ana City Jail in California. Sergio was recently diagnosed with cancer and a tumor in his head. He needs immediate surgery to remove the tumor before it's too late. Sergio must be released from detention to get the treatment he urgently needs. Let him go!" The displacement of local farmers to build the Caracol Industrial Park neatly exemplifies the "economic development" programs the United States and international institutions regularly promote in Haiti. On Oct. 22 Haitian president Michel Martelly hosted the official opening of the Caracol Industrial Park, a 617-acre tax-exempt factory complex in Haiti's rural northeastern corner that promoters say will bring as many as 65,000 jobs to the country. 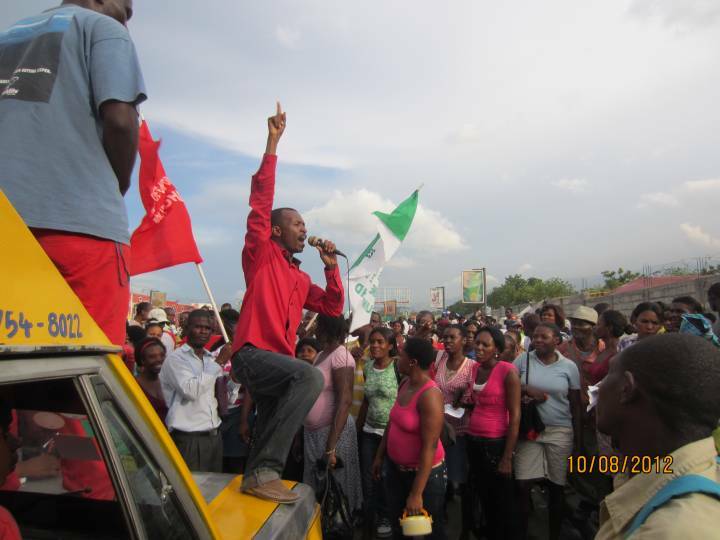 Photo of Oct. 8 workers' rally outside the Port-au-Prince industrial park, courtesy of Marty Goodman/Socialist Action. LA JOYA, Tex. — As a red pickup truck believed to be carrying drugs raced down a rural road near this border town last month, a state police helicopter that joined the pursuit warned units on the ground to keep their distance. Palisades Park, N.J. – It is about 8:30 a.m., just days after superstorm Sandy unleashed her force and fury in the northeast. Men with calloused hands, world-weary lined faces that make them seem years older than they are, practically stand on their toes in the lot of a closed gas station on the exit ramp off Route 46 in New Jersey. Each time a car slows, pulling into the lot, they swarm around it.